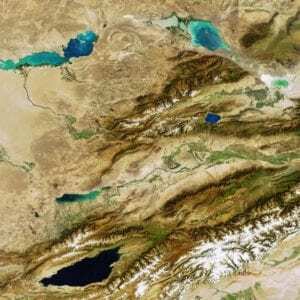 A satellite image of several of the lakes in the southeastern part of the Republic of Kazakhstan and in the northeastern area of Kyrgyzstan, taken by EnviSat in September 2007. Image courtesy of ESA. 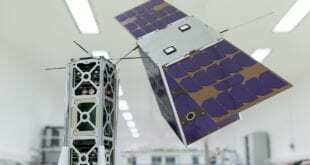 Kazakh space policy makers stated that the regional project would involve the construction of a constellation of five Earth observation satellites, with each country in the group owning and operating a satellite each. Kazakhstan proposed within the project to send working groups to all countries to analyse and study these plans. Experts also briefed the delegations that satellite remote sensing technologies are an indispensable tool for the study, and continuous monitoring, of the Earth’s surface and helps policy makers to effectively use and manage its resources as well as for environmental monitoring. Kazakhstan operates the KazEOSat-1 and -2 Earth observation satellites, and most recently launched the KazSTSat remote sensing satellite. SpaceWatch.Global has reported in previous months that Uzbekistan and Turkmenistan are rumored to be in discussions with Thales Alenia Space of France regarding their acquisition of high-resolution Earth observation satellites, though further details as to the status of these discussions have been hard to come by. It is also known that Russia, China, and Japan are also seeking to sell their Earth observation satellites to Central Asian countries.